My kitchen smells amazing. And who do I owe this honor to, but the duo of red peppers roasting in my oven. 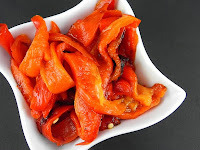 If you've never made roasted red peppers before, I implore you to do so. With their sweet, smoky flavor, roasted red peppers are an easy and delicious staple to keep on hand. And because you want them charred, there's no need to worry about burning them. Add them to just about any dish, be it pasta, salads, even the most humble sandwich. Store the extras in an airtight container, drizzle with oil and store for up to a week...if they last that long. Preheat the broiler on high. Clean the peppers with water and pat dry with a paper towel. Place the peppers on a baking sheet lined with foil. Broil the peppers for 15-20 minutes, turning every 2-3 minutes until they are black and blistered all over. Place the peppers in a bowl and cover with a lid or plastic wrap for 15 minutes. This will loosen the skin, making it easy to remove later. Peel the charred skin off of the peppers, remove the seeds and slice into strips. Drizzle with olive oil and store in an airtight container for up to a week.